frame size, each: 22 3/8 x 18 3/8 x 2 3/4 in. 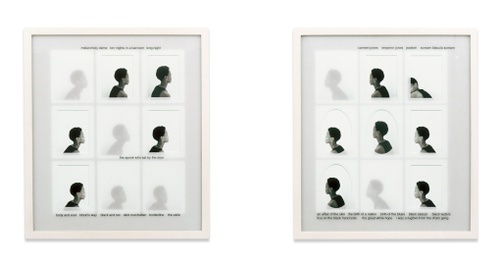 In a storyboard arrangement of images, Lorna Simpson combines portraits of a woman with titles of 20th-century films that present black women as highly sexual, exotic commodities. Presented in profile or otherwise obscured by vinyl overlay, the sitter’s face is never revealed— she could be anyone. Without being able to see her expression, how do we read her? We are left only with the short phrases surrounding the images, which are presented together as an inner monologue, making their racist and stereotypical undertones all the more distressing. What is lost when we cannot see a face? What is gained when we listen to someone’s experience, rather than rely on physical identifiers?